Why Can't I Change my Personal Profile Information? 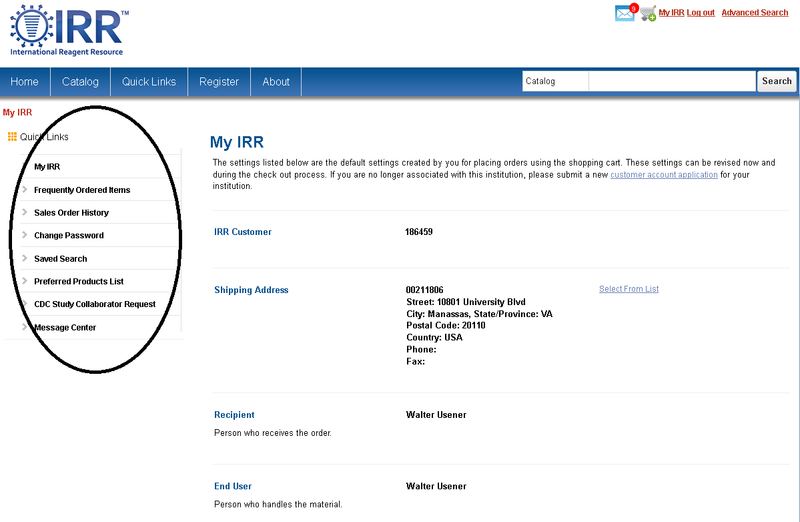 If you have a Registered Web Account with IRR, the My IRR section of the site will help you manage your account with sections to view personal information, see frequently ordered product lists, preferred product lists and saved searches, and get order status or order history. Click on one of the links on the left hand side of the page to jump to a specific section. If you have further questions, contact us. The information stored in your IRR Profile cannot be changed due to security and regulatory measures taken on by the IRR program. These measures ensure only qualified registered users receive IRR materials in which their laboratories or locations have the appropriate Biosafety controls and procedures in place to handle such materials. If you have any updates or changes in your profile information, please contact us for help. If you leave your existing organization or institution, you will need ro re-register with your current organization or institution. 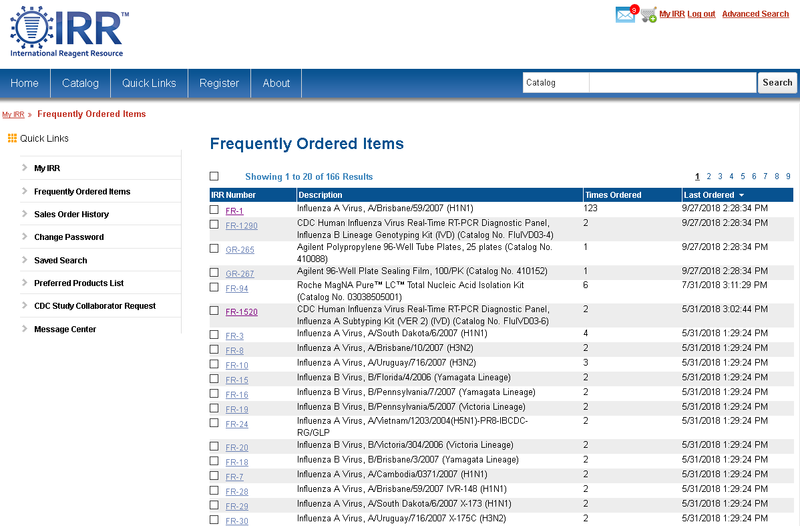 Use the sales order history to check the status of your order. 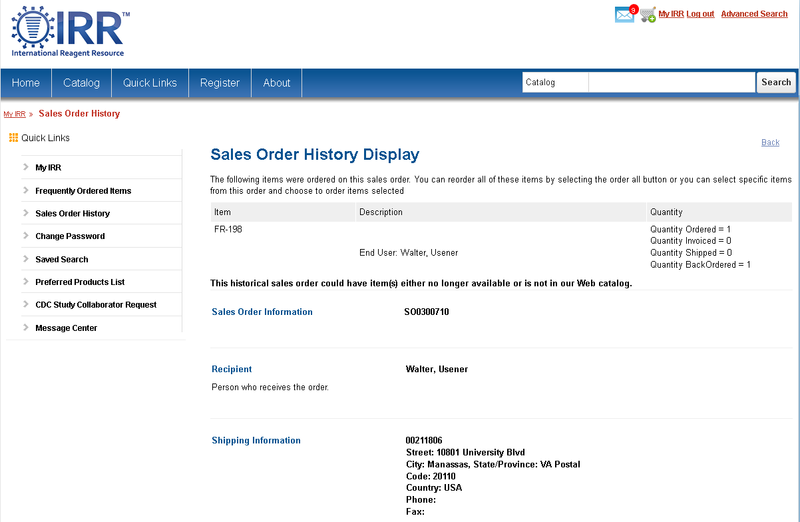 Orders with the status of "Pending" are recent Website orders; those with an "Open" status contain the expected shipping date and assigned IRR sales order number; "Closed" orders can be opened to be used to reorder items. Use the link provided here to view your Frequently Ordered Items. All items which you have ordered in the past will be displayed with the number of times they have been ordered (note: number displayed here is not equal to total quantity ordered, but how many times the item was placed into the shopping cart). 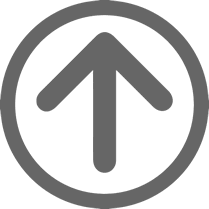 Logged in users have the ability to save searches in their my IRR profile. These searches can be recalled so that products can be easily found again using the same key words. New products on the site will also be displayed if they match the key word(s) in your saved search. Use the link here to see your saved searches. Logged in users can also add products to a preferred product list so they can be easily found again. Use button "Add to Preferred Product List" at the botton of the search results page. Use the link here to view your preferred product list.